The U.S. smartwatch market expanded drastically during 2018, according to a new report from NDP that crowns Apple the undisputed market leader. Price drops on Apple products continue heading into the weekend with iPads and Apple Watches getting the latest round of discounts. Pick up a 2018 iPad or iPad Pro at up to $100 off, or grab an Apple Watch Series 3 for $199. Better than Black Friday! B&H is slashing prices on Apple Watch Series 3 and Series 4 devices with cash discounts of up to $400 off, beating Black Friday markdowns in many instances. Along with the aggressive blowout prices, many GPS + Cellular and Nike+ models also come with a free gift, such as a free band or screen protector valued at up to $40. Grab these deals while you can, as supplies are limited. Apple has published a new video to its YouTube account teaching people how to use the Apple Watch Series 4's ECG feature, with the brief video detailing all of the steps required to perform the measurement on the wearable device. As February is Heart Month, Apple will not just have an activity challenge to mark it, but it will have heart health events in Apple Stores in San Francisco, Chicago, and New York. Puma this week revealed its Fit Intelligence self-lacing shoe, set to compete against Nike beginning in 2020. 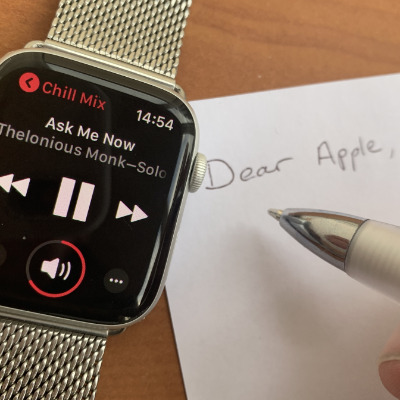 The Apple Watch is gorgeous, but you're not alone in being confused about how to play music on it. Apple has made it all inconsistent, contradictory and impossible to know at a glance where your music is coming from. AppleInsider has complaints -- and a wish list of solutions. You have to stream music from the Apple Watch to something in order to hear it at all, but Apple makes your choices confusing with mislabeled options and screens that do different things depending on you get to them. Here's how to listen to non-Apple Music choices like Spotify and play them through speakers. Coach has updated its Apple Watch strap lineup with new colors of their existing styles including a refresh to the popular Tea Rose Applique variant.